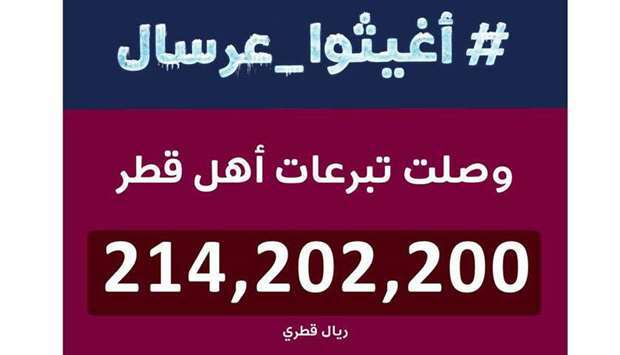 Qatar Charity on Tuesday raised more than QR214mn in donations for its 'Arsal Relief’ campaign which was aired on Qatar Media Corporation's channels. 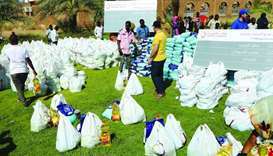 In a tweet, the charity said there has been an overwhelming response for the appeal as many organisations, establishments and individuals came forward to contribute generously to mitigate the sufferings of storm-hit Syrian refugees in Lebanon. 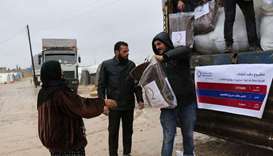 It also thankfully highlighted the $50mn grant His Highness the Amir Sheikh Tamim bin Hamad al-Thani has made to support the Syrian refugees and displaced persons, who are undergoing extremely difficult conditions as a result of displacement and the cold winter weather. Many commercial organisations have decided to donate a part of their sales revenues to the QC campaign and support it by all possible means.